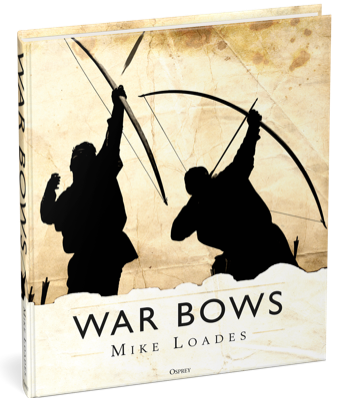 This superbly produced and lavishly illustrated hardback volume incorporates material on the Longbow, the Crossbow, the Composite bow and the Japanese bow. The longbow rose to military prominence in Europe towards the end of the 13th century, though it was in existence much earlier. Longbows were made from a single stave of wood, principally, though not exclusively, yew. The length of the longbow allowed for a long draw, increasing the force with which arrows could be shot. It was a mainstay of English armies during the 100-Years-War. The crossbow’s chief advantage lay in the ability to ready a shot and then hold it until the optimal moment. This made it ideal for siege situations. It was also a significant battlefield weapon in Ancient China. On the European battlefield, it was the principal missile weapon from the 11th to 14th centuries. It was first superseded, in English armies, by the longbow, and subsequently, in all armies, by gunpowder weapons. The composite bow was the elite weapon for Steppe Nomads and for high status warriors of numerous other Eastern and Near Eastern cultures. It appeared in a variety of forms and sizes. All composite bows were constructed from an assembly of wood, horn, sinew and glue, with techniques that enabled them to be preformed into recurved shapes. Composite bows were the weapon of the horse-archer and they were shot with a thumb draw. The Japanese bow – the yumi – was the defining symbol of the samurai class in Japan until the late 16th century. The yumi was a distinctively asymmetric longbow. From the 9th century it was constructed in laminate form, using bamboo and haze wood. Various configurations of lamination evolved in the ensuing centuries but the external profile remained the same. Its history is steeped in custom and ritual as well as triumph on the battlefield.